I would like to configure and change some shortcut keys of Nautilus (file manager of Ubuntu). Does anyone know where I could do that? Edit1: Precisely, initial binding for "go to parent folder" in Nautilus is Tab + Up arrow, I would like to chang it to Ctrl + Up arrow because Tab + Up arrow has already been set to other things via Compiz. In Ubuntu 13.04 through 16.04 at least, the keyboard shortcuts for Nautilus are mapped in the "~/.config/nautilus/accels" file. Edit that file to change the mappings. 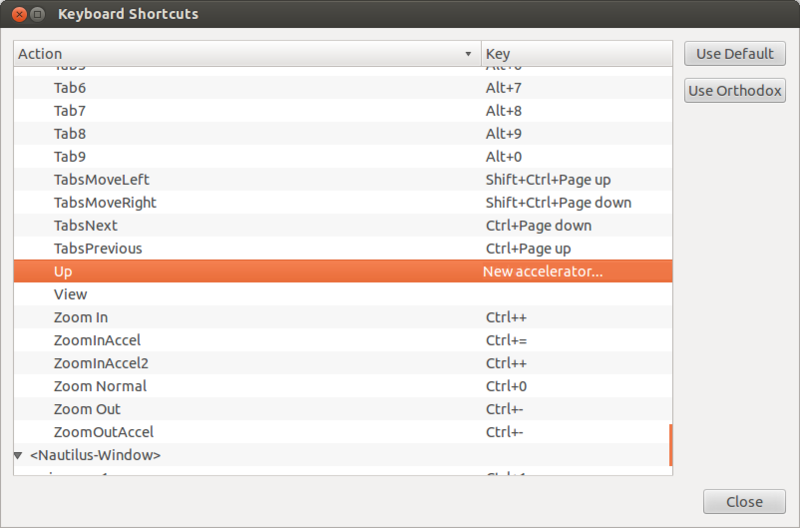 This Nautilus extension allows you to edit keyboard shortcuts (accelerators). Unlike the can_change_accels solution this will also work with Unity's global menus. Probably you need to log off and back on again to make this change take effect. Afterwards just point at the menu entry whose schortcut you want to change and press the desired keys. After all changes are done, you can turn on global menu again. Not the answer you're looking for? Browse other questions tagged nautilus shortcut-keys or ask your own question. How do I type in a file path? Is there a way to set a hotkey to change screen brightness? Reposition window using num pad, deprecated?